My dad recommended this one to me. He's a pretty big imperial stout guy (actually, he's a fan of dark beers in general) and I tend to take him at his word with this kind of stuff. So, when he suggests I try one it usually means I'm in for a treat. Heavy Seas' Peg Leg seems to be everything one could want from an imperial stout: High ABV? Check. Roast malts giving a chocolatey coffee aroma and flavor? Check, as long as Peg Leg's online description is to be believed (unfortunately, experience has led me to take brewer's descriptions with a grain of salt). Odds are I would've gotten around to trying this one eventually. But my dad's recommendation pushed it to the top of the list. Heavy Sea's is a brewery located in scenic Baltimore, Maryland. I've only been to Baltimore once, when I was a kid, but I vaguely remember the city being split by a body of water which meant that the old party of the city was on one side and the newer part was across from it. I could be wrong though, I must've been around 10 at the time so there's a good chance that I'm inadvertently lying to you, but if I'm right than the pirate logo for Heavy Seas is fitting. The origin story of the brewery, as listed on its website, goes like this: Hugh Sisson started out working for a pub his father owned. He then turned it into a brewpub. He then left the place to found Clipper City Brewing Company. That brewery absorbed another brewery called Oxford. Sisson then started the Heavy Seas brand and Oxford was discontinued and the Clipper City brews were turned into Heavy Seas brews. Looking at this, you have a history that runs twenty-five years; form 1980 to now. With a background that reaches so far into the past, Peg Leg has to be good, right? 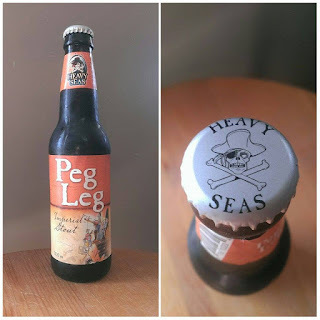 If Heavy Seas' Peg Leg page (linked at the start of this post) is to be believed, it is. As mentioned above, the brewery says the beer has a complex aroma with coffee and chocolate notes, flavors of roasted barley and a balance of sweetness and bitterness from the stout's malts and hops, and a creamy mouthfeel. 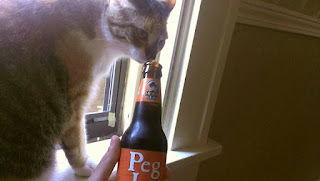 I'm not sure if I've ever actually said this in a post before but Purrl always gets to smell my beer before I do. Always. And man, does she like how this one smells. She gave Peg Leg and grand total of nine whiffs. This brew has cat appeal down pat. What do I think about the stout's aroma, you ask? It is complex. I can pick up the coffee and chocolate. It's everything that Heavy Seas promised. But, there's something else here too. It smells like a windmill cookie (it took me a good while to place that scent, so please appreciate it). Peg Leg tastes like a really, really good homebrew. And I mean that in the best way possible. I like the beer. It's bitter, thanks to the hops, and roasty. Heavy Seas hit a fantastic balance here. There's a slight fruity flavor lurking in the aftertaste that I can't attribute to any of the ingredients I know went into the brew. Could it be the barley? Yeah, sure, maybe. I don't think it is, though. The mouthfeel is definitely creamy. All in all, Heavy Seas has done a good job of putting its money where its mouth is. I'll go on record and say the brewery has the most honest beer description I've seen. Heavy Seas' imperial stout makes me think of early fall in the apartment in which I started this blog (I've since relocated). There was a 3-seasons room where I'd open the windows (an action that didn't really rid the room of any heat), sit back, crack a beer, and lose myself in a book. I'd read a chapter or two beyond my final swig of the brew before heading into the main interior of the apartment to undertake responsible adult things like job-hunting or cooking a meal. Blame it on the heat of my current apartment, blame it on the roastiness of the stout, blame it on whatever. Nothing will alter the memories that Peg Leg brings to my mind. This brew has an ABV of 8% which means it could be aged. And, should you grab more than one, by all means, age it. But if you only grab one, open it an drink up. If you like stouts or other dark beer you'll enjoy it. I sure do. It's impressive and something I'll definitely purchase again. I'm giving Heavy Seas' Peg Leg Imperial Stout an 8.5/10. I can't wait to see what other kinds of brews the brewery has in its treasure chest trove of beers.